As part of my 12 marathons in 12 months challenge for the charity Mummy’s Star in memory of Ben Ashworth, yesterday I did the 2018 Asics Great Manchester Marathon. It was my second time doing the race and I was looking forward to it as so many people from my running club were also taking part and I thought that it would be nice to share the experience together. It was an early start to the day as my friend Ben was coming to pick me up and take us to the Poachers pub near Preston where a minibus had been booked for 7am. The journey actually felt really quick. Once we arrived, we had around a 10 minutes walk to the start and it was amazing to see so many runners eagerly waiting for the start of the race. One thing I love about big races like this, is that they attract a big crowd and I love interacting with the crowd as I think that is part of the fun. As Ben lost his battle with bowel cancer, I had made the decision to do all my marathons this year in bum shorts. The thing about running in fancy dress is that nobody judges you and it is all part of the fun. The race got underway and I went at a nice gentle pace. I didn’t really aim for a time, I just aimed to finish and that was my target from the start. However, coming towards end of the first mile, I saw Phil the 5 hours 30 mins pacer who I felt was also going at a reasonably pace so I decided to stick with him. This was the first time ever in a race that I decided to stick with a pacer and I found it helped as I was talking to more people and therefore not looking at my watch as much. It was nice getting to talk to fellow runners as they all have a story about why/how they took up running in the first place. I was enjoying the run up to now as the pace was still very gentle and something that I could maintain over a longer distance. As we got to the half way point, we were bang on target with a time of around 2 hours 44 mins so the 5 and a half hours should easily be achieved however at this point, I was starting to feel the pain. At round mile 17 I decided to change my technique and try some interval training techniques to see if that would help me keep up with Phil and the rest of the team as I felt my body tire. It did work for a few miles up until mile 20 where it felt like I had well and truly hit the wall. Now was the time to ignore the 5 hours 30 mins and focus on getting the job done. Consiously, you can think you have already done the hard work by running 20 miles but there is still a long way to go. Now I was struggling to even run 10 yards without stopping. I felt it would be better to walk so I ended up walking for the majority of the last 10k at this point. I had 2 highlights of the whole race. The first was seeing my fellow Red Rosers at around mile 24. This gave me a much needed lift and it was so nice to see them come out and support/encourage everyone. It really does make lots of difference and I that point I was running again. The second highlight was seeing Claire Lomas who is paralysed and is hoping to do the whole marathon distance in 17 days. She was trying to walk aided by walking sticks with support from others and when you see things like this, it does help put things into perspective and does motivate and inspire you. It was so lovely to see. Claire is fundraising for Nicholls Spinal Foundation and to find out more info/donate please click here or to donate click here. Now the finish line was in sight, I just had to dig deep for the last mile and a half and at this point it does feel good to know that you are so close to the finish. Sometimes I feel I pick up the pace on the last mile purely due to adrenaline but even that wasn’t happening on this occasion but I take all these as positives as it constantly reminds me of how mentally strong I can be. On reflecting on the race at first, I was a little disappointed as I was the last Red Roser to finish and I was comparing my times with the others. However I remembered my sole aim at the start was to finish regardless of the time and that to me was job done. As runners we always tend to compare but honestly we really shouldn’t. Everyone has their own capabilities and you just have to run your own race. Just because they are faster runners doesn’t mean we are rubbish in any way shape or form. Thanks for reading everyone. If anyone wants to donate to my 12 marathons in 12 months challenge for Mummy’s Star in memory of Ben, please click here. These shorts are too good! What a fun garment to wear for a great cause! 12 marathons in 12 months challenge wow!! Now, that is dedication! One thing I love about races is seeing other runners excited to start and prepared to already start zooming the race course! I haven’t raced in a while – hopefully in a few months I’ll be at a starting line – and one thing I definitely can’t wait for are the crowds that races attract! I always read from other runners that the crowds energy sometimes is what keeps them going. I often read about marathon runners hitting an imaginary wall at mile 20 – 22, since most people don’t run marathon distances as an endurance run, it can get tiring when going the full distance for the actual race! Thank you so much for the lovely comment. The crowds are amazing at times. The wall can be really hard but it’s about pushing through and testing yourself. Hope you get to do that race soon! Having a bowel disease myself, the bum shorts really made me chuckle! 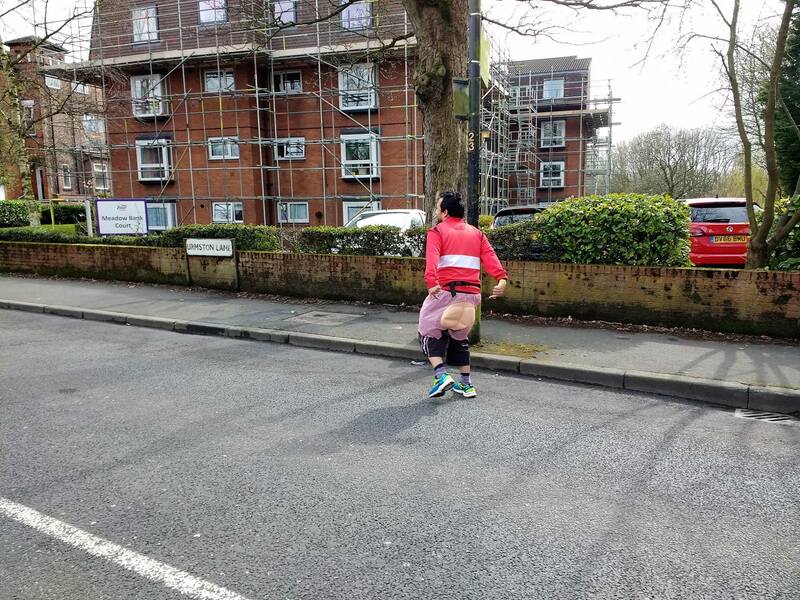 I recently did a charity walk for my disease and there were people dressed up as a toilet and a giant poo! Well done you for completing this and taking on the challenge, it’s a huge achievement and I hope it continues going well for you! 12 marathons in 12 months is amazing! Well done, that’s going to be such an amazing achievement. I always enjoy reading your running posts, can tell how much you enjoy it! Thanks so much. Glad you enjoy reading them! Wow congratualtions, I’m not a runner at all but have so much respect for you, I could barely do one marathon let alone 12 in 12 months! Wow, running 12 marathons in 12 months for a charity says a lot about the kind of person you are 🙂 Loved also your non-competitive attitude! Great job. It’s good to hear you remembered you were there to run the race and not compare your time or pace to anyone else. Keep up the good work! Sorry for the loss of your friend!! You are doing something really amazing well done to you!! Someday I hope to complete a marathon but at the moment i am still in the realm of 5ks haha. I love running though and i think what your doing is amazing. Thanks. Would you like a comment on any post of yours? Goodness gracious! You’re a freaking superstar!! I was trying to do a race challenge, but it was more in like, run 15 races in a year kind of thing but not marathons!!! Best of luck completing the remaining 6!!!! 12 Marathons in 12 Months?! Thanks so much. That comment means a lot! I really like your blog too so suscribed and followed on Twitter and Insta! What an amazing thing to do! 12 marathons in 12 months that’s incredible! Well done! Keep going! You’re doing great! 12 marathons in a year,is just wow! All the best for more Marathons to come and please don’t forget the fitness post. Wow! So happy you did this marathon and completed it, who cares about the time! And thanks for sharing about the woman who was doing it in days instead of hours, since I can see myself doing something like that some day and I know I never will be able to actually RUN a marathon. So that little tidbit was very encouraging to me, thanks! Kudos to you for doing 12 marathons in 12 months as a fund raiser. again: Wow!